"MP3 players are great for people who want a portable device that can store and play music. While there are thousands of MP3 players out there, our focus for this article will be specifically on waterproof MP3 players. Waterproof MP3 players are usually designed for use when swimming, however are also great for the shower, days by the lake, or even fishing. Anywhere that you would worry about a regular MP3 players getting wet is where a waterproof one will obviously shine." This Tayogo waterproof music player is the first of its unique design that I’ve personally tried. It’s basically all one piece – a molded plastic headband with rubberized head goes around your head for minimum slippage while swimming and two standard earbuds are wired to both ends of the headband. The USB main player component of the device is detachable, so you can easily disconnect it from the headband and add more music to it. The player itself has 8GB of memory (2000 songs or so), which is nothing groundbreaking in today’s day and age. It’s more than enough for quite a few playlists while swimming, however, so you shouldn’t have any storage issues with this model. The entire unit is completely waterproof and heatproof as well. This is one of those things where the primary purpose of it is to be rugged and practical to use while swimming and exercising in the water and heat. It does both of those exceptionally well, so it’s a winner in my book. However, some people do complain about the audio quality. It definitely doesn’t have high fidelity audio or anything like that, but it more than gets the job done for a workout mp3 player in my humble opinion. The Diver DB-10 is a simple waterproof music player that does what it advertises at a reasonable price. It’s not very fancy, and is quite literally a USB stick with a few media control buttons on it + a pair of waterproof headphones. Don’t be skeptical though, some thought very clearly went into the design of this cool little underwater player. The earphones both have hooks that go around your ears so they won’t dislodge when you’re swimming fast, and the mp3 player itself has a very sturdy hook on the back of it so that you can clip it right on to a headband, swim cap, or even your goggles while swimming. The 4GB of storage is a big on the low side, but will still get you right around 1000 songs or so – more than enough for even a Michael Phelps-level swim session! 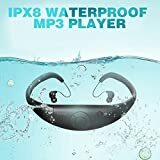 Overall, this is a lightweight, waterproof no-frills media player that does exactly what you need it to – play music underwater without hindering your swimming or falling off mid-race. Rechargeable Battery. 12 Month Warranty. Plug n play (Windows and Mac). USB Cable included. I love this simple stand by Crafty Gizmos mainly because it comes with a super slick waterproof carrying bag that makes transporting it an absolute breeze. You simply fold the stand up, toss it in the carrying bag, and get on your way – this one’s awesome for any musician who travels often. The stand itself is quite well-designed and well-made. It’s surprisingly lightweight, but remains sturdier than many other music stands you’ll come across. You can control the height and rotation at three separate places along the body, so you’ll always be able to get it all set up at the perfect height. The music tray itself features two sliding guides that make it super easy to open/close the stand – it can often be hard to get the top part of a stand opened up, but that’s simply not so with this one. The tray also features two spring-loaded holders for your actual sheet music, which function much better than the single wire you’ll usually see keeping your sheet music secured to the stand. Another offering from Underwater Audio, this is by far my favorite waterproof mp3 player on our list. They took a normal iPod shuffle and made the entire thing waterproof. Then, they bundled it with a pair of Swimbud earbuds and a pair of HydroHarmony headphones, and shipped it as the ultimate underwater audio bundle. The Apple brand name speaks for itself, so I won’t spend much time talking about how awesome the iPod shuffle is. Underwater Audio waterproofed the entire thing internally past 200ft deep, and it’s 100% waterproof and corrosion-proof. If you’re looking for the most premium waterproof music player option out there, this is it for sure. 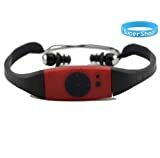 I like this one because Supershop took the time to make their nifty little waterproof device both a USB MP3 player and a functioning underwater FM radio. I know most people just go the route of personal music nowadays, but sometimes it is nice to just channel surf the radio when you get bored of your own playlists. 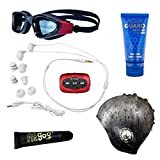 For a bargain price, you get a waterproof MP3 player/FM radio, a pair of waterproof headphones, and 8 hours of battery time on the media player. Overall there’s nothing stellar about the quality or delivery of the bundle, but at this price point it’s essentially disposable and works perfectly as a last-minute grab before a trip somewhere you’ll be getting wet or dirty. This item is a waterproof MP3 player & FM Radio designed for swimming, diving and other underwater sports. High durability aluminum casing with anti-scratch. USB rechargeable battery, it can work for 8 hours when fully charged. Water Resistant– The device has been made to resist some water. Small splashes such as rain or handwashing usually will not cause damage. Water Repellent– The device usually receives some sort of coating to make it repel water even more than a water resistant device would. This is only a small step up from water resistant and is still not safe for swimming uses. Water Proof- This is what you should be looking for in a MP3 player that will be used in the water. Waterproof means that water will not get inside and ruin the device. The device will have special seals to stand up to water pressure as well as a hydrophobic coating. Every device should be graded with a depth that they are waterproof to. You must consider a variety of things when purchasing an MP3 player to ensure that it works with your lifestyle. Coming short in any of these categories could result in performance that isn’t up to par for you personally. Storage- This is the factor that decides how many songs can be stored on your MP3 player. Storage is usually measured in megabytes or gigabytes. 1000 megabytes is equivalent to 1 gigabyte. Because of the cost of storage going down throughout the years, we recommend at very minimum that you get a 1 gigabyte (the more the better though). That is enough for roughly 125-250 songs. The more music you have, obviously the higher amount of gigabytes you should get. File Type Playback- Some MP3 players are capable of playing back more than just MP3s. For the most part, this is not a big deal. However, if you plan on playing a variety of file types, then look for one that specifically states that it can play those back. An example of another file type is an MP4 which is a video file. Connectivity/Software- This is what decides how you will connect your device to different things. For example you may be able to connect to speakers wirelessly through Bluetooth. You will also need a way to connect to your computer. This is usually through a USB cable. When you plug the device into the computer, software will likely automatically ask for installation. You will need this software to manage how you put music on the device. The software is usually simple and not demanding however if you have an older or underpowered computer, you will want to check that it will run the software. The next big thing about waterproof MP3 players that you should consider is the actual size of it. If you are a swimmer and like to attach it to the back of your head, then a big one may not be nice to swim with. However if you are getting a waterproof one as a precaution and it will just be sitting in your boat, then maybe the size doesn’t matter. The biggest thing here is to know what you want before purchasing it. Remember that just because you want a small one, it does not mean that that you can’t have a lot of storage. Of course big ones can fit more storage if you stuffed them both full but usually that is not the case when it comes to building them, so a smaller one might have just as much storage. Here is another very important factor to consider. Good quality headphones will stay in your ears while you are swimming and prevent water from getting in and muffling the sound. If you already have a separate set of waterproof headphones then great! However if not, you will want to spend a fair amount of time looking at the headphones that come with the MP3 player, or looking at purchasing a separate high quality set. Usually ones that you can purchase separately can be of higher quality but also come with that price tag. Here is where you need to decide your budget. The higher the budget, the more likely it is that you will get something with good sound, that is comfortable, and that comes with nice headphones. The best way to decide what is good for you is to of course try it for yourself. Perhaps a friend has one that you can test? If not, you should put some research time into reviews of your favorite ones. Reviews such as on Amazon and EBay, give a good idea of how a product has performed for others. Especially if you look under verified users. Another option that you have is to get a waterproof case. This may work well, but you will likely need to purchase waterproof headphones separately. A waterproof MP3 player can ensure that you have good tunes playing no matter the situation that you are in. Remember not to cheap out and get something that is good quality. This will also help to ensure that you have headphone produce nice sound. Waterproof is what you want, don’t get either of the others if you are planning on submerging the device. Finally, enjoy listening to your tunes!